Ukrainian forces check burnt vehicles after rebel shelling. Kiev again accused Russia of sending soldiers into Ukrainian territory on Monday, a day before the presidents of the two countries are due to meet. Kiev said Moscow was trying to alter the reality on the ground ahead of the talks, sending in a column of Russian armoured vehicles disguised as local separatists. Russia strongly denied any such moves, though foreign minister Sergei Lavrov said on Monday that Moscow plans to send another humanitarian convoy into Ukraine, with or without Kiev's agreement. Vladimir Putin and Petro Poroshenko will meet on the sidelines of a summit in Minsk on Tuesday afternoon, but hopes that the dialogue will bring about any major improvement in the situation on the ground in east Ukraine appear slim. On Monday Poroshenko expressed his "extraordinary concern" over the alleged Russian military moves and the second humanitarian convoy in a telephone conversation with top EU official Herman Van Rompuy. "This morning there was an attempt by the Russian military in the guise of Donbas fighters to open a new area of military confrontation in the southern Donetsk region," said military spokesman Andriy Lysenko earlier in Kiev. The Ukrainian military claimed to have halted the advance close to the town of Novoazovsk, not far from the border with Russia on the Azov Sea. Moscow denied that any such incursion had taken place, and the Ukrainians did not provide any immediate proof that Russian military vehicles were involved, although there were reports of heavy armour in the area. In recent weeks the separatists have been pushed back into areas around their main strongholds of Donetsk and Luhansk, but could make life harder for the Ukrainian forces by opening a second front from the south. The Minsk summit is a meeting between the EU and the heads of state of Putin's Customs Union, which includes Belarus, Russia and Kazakhstan. Russia has long wanted Ukraine to join the Customs Union, and it was former president Viktor Yanukovych's U-turn over signing an EU integration pact in favour of further consultations on the Customs Union that sparked the protests last December that eventually led to his downfall. Poroshenko and EU foreign policy chief Catherine Ashton will also attend. Ukrainian officials did not hold out much hope for a breakthrough at the talks. "Putin has been the dictator of Russia for 14 years and is used to dealing in blackmail, threats and provocations," said Anton Gerashchenko, adviser to Ukraine's interior minister, in an interview with Ukrainian television. "He will do everything to make Ukrainian citizens feel nervous and threatened." Vladimir Putin's spokesperson, Dmitry Peskov, said that the meeting between Putin and Poroshenko would probably touch on "the internal Ukrainian crisis", as well as issues of Russian humanitarian aid, "to avoid unnecessary delays" in its delivery. Last week a convoy of over 200 repainted military trucks entered east Ukraine from Russia, carrying much-needed aid for the beleaguered residents of Donetsk. Ukraine said Russia sent in the convoy without proper permission, amounting to an "invasion", while Russia accused Ukraine of manufacturing delays to keep the trucks out. Destroyed tank belonging the convoy that broke through from Russia directed to Novoazovsk. 25. August 2014. On Monday, the Russian foreign minister, Sergei Lavrov, said it would send another convoy into Ukraine, in defiance of Kiev and the west. Lavrov also said he saw "nothing humiliating" in a parade of Ukrainian prisoners organised by separatists in Donetsk on Sunday. Crowds hurled abuse at the men as they walked, heads bowed and surrounded by their captors, through the city's central street, while a cleaning vehicle demonstratively washed the tarmac behind them. Some have suggested that the parade was a breach of the Geneva conventions. Lavrov said lawyers should examine the footage, but personally he found nothing humiliating about it. 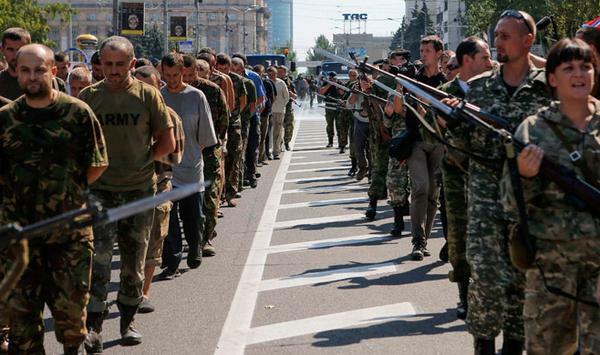 The prisoner parade was held as a response to a large military parade in Kiev to mark Ukraine's Independence Day, which included 1,500 soldiers and 90 units of military vehicles and heavy weaponry, including the Grad rockets that have caused many civilian casualties in eastern Ukraine. ICRC recognized today Ukraine is at war,but wouldn't say whether 'civil' or international.This could latter make Russia liable for war crimes, among which for yeterday's POW march in Donetsk. European politicians have come down harshly on Russia for its actions in eastern Ukraine, with several rounds of sanctions imposed by the EU and US. However, there has also been pressure on Ukraine to make concessions, with Angela Merkel telling Poroshenko during a visit to Kiev on Saturday that Kiev should increase autonomy for the eastern regions. After leaving Kiev, Merkel said in an interview with German television that "decentralisation" of power in Ukraine was important, and hoped that a breakthrough could be made in Minsk. "I want to find a way, as many others do, which does not damage Russia. We want to have good trade relations with Russia as well. We want reasonable relations with Russia. We are depending on one another and there are so many other conflicts in the world where we should work together, so I hope we can make progress," said Merkel. With pressure from nationalists in both countries, it is unclear whether either side could make enough concessions to satisfy the other. Ukraine has said that signing a new version of the EU integration agreement is non-negotiable. Kiev is also against introducing Russian as a second-state language and federalising the political system, both things that Russia is demanding. Kiev wants Russia to stop organising and funding the insurgency, something that Russia denies it is doing at all. Lavrov again insisted on Monday that there are no illegal incursions over the border, claiming Russia was "fully responsible" for its side of the border and noting that an OSCE observer mission had not fixed any illegal crossings of weaponry. However, the OSCE are only mandated to monitor the official checkpoints, and are not allowed to observe the long, unguarded stretches where dirt tracks criss-cross the border and where unmarked military vehicles can frequently be seen coming and going. It was on one of these tracks, close to the Russian border town of Donetsk, that the Guardian saw a Russian military column make an incursion over the border into Ukraine earlier this month. Ukrainian officials said they had later destroyed it, but did not provide any evidence. Russia denied the column ever crossed the border, claiming it was a border patrol mission that operated strictly on the Russian side.